One can't help but think the title of this track, "Won't Let You Down" is a perfect way to describe the music video accompanying it. 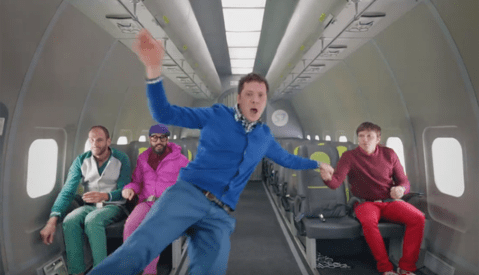 With incredibly smooth video work (to the point where it almost feels CGI at times), OK Go has been able to up the ante once again with their latest music video. Pairing those transitions with a simple and charming concept, results in one of the best music videos I've ever seen. As for the setup...and some behind the scenes shots. Perhaps videos like the one above are a prime example for the US Government to show the positive uses of video mounted drones. With a raging battle aiming to block them from the general public, it's up to us to show what positive productions can come from the use of drones in videography. With the right talent, and a clever concept, nothing is stopping the average videographer to create spectacular videos like the one shown above. Yup. Pretty neat. I even will add that you don't really get the full effect that leaves you glowing until you get to the end. That major digital-readout-effect in analog with umbrellas all coordinated perfectly (and in 4 colors!!!!) is f#$%ing awesome! C'mon FS, you're the kings of BTS. 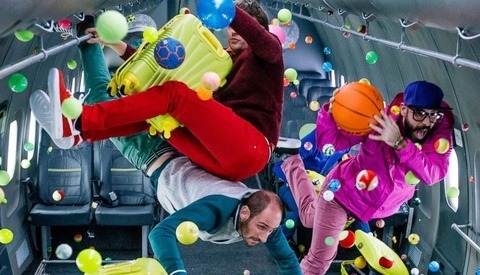 Find and show us the BTS for this insane production. I gotta see it. Thanks. I dug around for a long time and couldn't find much in terms of BTS. If I find anything, I'll add therm (I can find some more on Instagram for you). This is an amazing concept and cinematography! Im still wondering did they use any stop motion on the video? thanks..